Trying to find the best place to play bingo online can be a bit of a nightmare. It must seem like every time you put ‘best bingo sites’ into your search engine another dozen or so new titles have been added to the list. Gambling online has taken the world by storm which means that software developers are working tirelessly to keep up with the ever increasing demand. In one way it’s a good thing because it means that you, the player, have an endless supply of online rooms to choose from. The downside is that when you want to compare operators it can be difficult to know where to start. But help is at hand because this site has been created to help guide you through the minefield when choosing the best site for you. In less than a year, this Dragonfish site has garnered quite the interest and for good reason. A vibrant new operator, YAY Bingo offers a welcome bonus with no wagering requirements, monthly cashbacks, and daily free spins. Deposit £10 and claim a 400% Bonus Bundle £20 Bingo Bonus AND £20 Games Bonus. At Wink Bingo, there are numerous promotions for both newly registered players and loyal customers. Free bingo in the Newbie Room, mystery jackpots, and daily challenges for a chance to earn extra Wink Rewards & Bingo Tickets are just some of the exciting promos here. Instantly recognisable, 888Ladies owes much of its popularity to the exclusive bingo rooms and slots, but it also attracts players with a great welcome offer and a fantastic bundle bonus for bingo and slots when you deposit just £5. £30 Welcome Bonus + £10 Mecca Bingo Club voucher and 20 extra spins. One of the most popular bingo brands in the UK, Mecca has some impressive bonuses, quality games, and the awards to prove how good they are. New customers enjoy free bingo and regulars are treated to daily jackpots and giveaways. GiveBack Bingo not only lets players enjoy a plethora of bingo and slot games, but also supports numerous charities helping people and animals in need. Registered payers enjoy a generous welcome offer, reload bonuses, and many ongoing promos. * T&C’s apply; Click CLAIM BONUS for details. The online bingo market is worth millions in the UK, with 500 online sites offering their services to customers who will eventually end up having a hard time making the right decision. Watch out for sites with similar sounding names to the most well-known brands. They may be spelt slightly different and quite often only one letter will be changed. They’ll more than likely be a scam site. A reputable, honest provider will want to create an individual image and reputation, not feed off somebody else’s. With so many great sites to play at, there really is no reason for you to giving your money to those who are substandard in any way. This offer is only available to new Betfred Bingo customers. Promo code BINGO90. Minimum deposit & stake £10 on Bingo Tickets. 2x wager on £40 Bingo Bonus. 14 day bonus expiry. Bonus Balance used prior to Cash. 50 Free Spins on Rainbow Ryan credited within 24 hours. Payment restrictions apply. SMS validation may be required. Full T&Cs apply. This offer is only available to new bet365 Bingo customers. Your first deposit/transfer (minimum £10) to bet365 Bingo will qualify for a 200% Bingo Bonus, up to a maximum of £100. This is your ‘qualifying deposit/transfer’. You must claim the offer via the Offers Available section in Members. Once claimed, you will need to wager the amount of your qualifying deposit/transfer (capped at £50) once on Bingo Tickets in order to bet with your bonus. You must wager your Bingo Bonus four times on Bingo Tickets before you can withdraw your bonus funds. Please note that bonus funds cannot be used to purchase tickets in the Deal or No Deal Bingo rooms. Any funds that you deposit/transfer after claiming the bonus and/or any winnings from them can be withdrawn at your discretion without any impact on this offer. If you make a withdrawal prior to claiming the offer then you will no longer be eligible for this offer. If the wagering requirements have not been met within 30 days of you claiming the bonus then any funds held in your bonus balance and any winnings attributable to them will be removed. The aim of this site is to do all the time-consuming legwork for you, so you don’t have to spend hours and hours trawling the internet for the best bingo sites to play at. But don’t think this means you shouldn’t do your own research as well. What it does mean is that your list of possible site candidates can be reduced to a more manageable number, rather than being faced with looking at hundreds of different websites. There are hundreds of different bingo sites in the UK and with the game increasing in popularity, plenty of new ones are joining the ranks of the best online rooms. 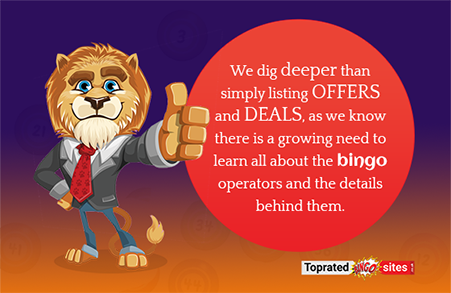 All of us here at topratedbingosites.co.uk are players ourselves and appreciate how difficult it is to find the best and most trusted one. Which is one of the main reasons for starting this review site. Our knowledge and experience that we’ve gained over the years has to be worth something. So why not share it with the hundreds of newbies looking to enjoy a great game, too? The information contained within this website, is everything you need to know before signing up for an account and depositing some of that hard-earned moolah. But this site isn’t just aimed at the newcomers to the world of online bingo. More experienced players will also be able to discover useful information that will enrich their gaming experience, too. What Has Been Going on in the Online Bingo Industry over the Past Year? Have all the cute mascots and fluffy slots characters secretly been banished from the bingo sites for unspeakable sins? Oh, and what the heck happened to the no-deposit offers? Such agonizing questions that have been vexing online bingo players over the last year actually have pretty simple answers. It’s the government! But before you go ahead with the conspiracy theories or revolutions, make yourself a cuppa and peruse our thorough analysis of the industry that gives all the answers to the ‘Why?’s, ‘How?’s, and most importantly – the ‘What now?’s, as we take a detailed look at all the financial and legislation regulations and the shift in player demographics that are shaping the new face of online bingo. Are you curious to know who your roomies really are? We asked hundreds of UK bingo players to find out more about why and how they play and here are their answers – all analysed and broken down for you. Time to meet the real Bing0_Mum23! It may be just numbers and graphs, but they paint a mesmerizing picture of what goes on behind the scenes. Step into the shoes of bingo operators and see what they need to tackle in order to give you the quality content and daily dose of entertainment. We’ve made an in-depth analysis of the operators’ approach, business strategies and industry compliance as they try to adapt to stricter regulations, as well as the latest trends in players’ attitudes as influenced by social media and advertising in order to give you a better understanding of how online bingo sites work and what you need to look for when signing up with an operator, along with the following list of established criteria. You’re probably already wondering what kind of information you’ll be able to find to help compare the most trusted online bingo sites. Well, let’s share some of the features we’ll be looking at. And bear in mind that these are key aspects, so when you do your own research, our advice is to look for them, too. Initial impressions – it’s said that you shouldn’t judge a book by its cover, but in the world of online bingo, first impressions count for a lot. When you roll up at the front page of a website you’ll be able to tell almost instantly when the last time was that the software developers and the website operators gave the site any love and attention. The front pages are also very revealing with regards the welcome offers, bingo games, latest side games and sometimes even the top winners. You should also find some information regarding the license of the operator. Although this tends to be tucked down at the bottom of the page. Licensing and regulation – this is an important feature because you want to pick a site that is licensed and regulated, preferably by the regulatory body of the country you reside in. Only by doing so can you be sure you’re playing at a site that is fair and follows certain rules and guidelines, aimed to protect you – the player. For those of you living and playing bingo in the UK, the relevant regulatory body is the UK Gambling Commission or some of the jurisdictions on its whitelist which are all EEA countries, Alderney, Gibraltar, Antigua and Barbuda, Isle of Man, and Tasmania. The UK Gambling Commission ensures all license holders are regularly audited and comply with the strictest of standards. Corporate responsibility is high on its agenda and the companies need to provide fair treatment of customers’ needs and good player protection. Bonuses – this is a feature of the bingo site we like to look at because it means you could be getting something extra. And sometimes it’s something that requires nothing from you except the completion of a signup form. Competition between the many different sites online is fierce. Something more than just a smooth and attractive website is required to attract new players and stand out from the crowd. One very popular way to do this is with generous bonuses, especially in the beginning. The bonuses actually come in all shapes and sizes. They could be no-deposit, matched amounts, fixed amounts, percentages of a deposit, free spins, scratch cards and much more. Games – of course you’re going to want to know about the games. After all, they’re the reason you’re looking for top rated bingo sites in the first place. It’d be really hard to cover in detail all the variants available at each operator we review, but our aim is to give you a general idea of the type of rooms you can join. We’ll also let you know whether there are any free games to take advantage of. Free games are a great way to discover how the games work before risking any money. Banking options – the best bingo sites should offer you a number of different payment methods. The more the merrier really. You’ll find that most accept credit and debit cards, along with a number of pre-paid cards, vouchers and e-wallets. We’ll advise you of any minimum requirements and whether there are any limitations as to how much you can withdraw and deposit. Customer service – this is a biggy in our book because even in today’s IT advanced world things have a tendency to go wrong every now and again. And when it happens it’ll be reassuring to know there is someone you can turn to for help. Ideally, it should a service that’s available around the clock because you can’t predict when a problem will arise. And the chances are it’ll happen in the middle of the night. There should also be a number of different ways to get in touch, with instant chat being the favourite option, at least for us. Mecca is an operator that utilises all channels for customers to get in touch, supporting a live chat around the clock, toll-free telephone number for the UK, and email and snail mail for when you feel like sitting down and penning a letter. Mecca has one of the best communities, with a serious following and social media engagement on Facebook, Twitter, YouTube, and lately Instagram. On its website, players can find detailed explanations of all its games, plus useful info on chat room etiquette and bingo lingo. Wagering requirements – before you take advantage of any generous bonuses, and believe us when we say there are going to be plenty that are very, very tempting, consider the attached conditions. Bonus funds always come with various terms and conditions. They are usually eligible games, validity, and the big one, wagering requirements. Wagering requirements are often the conditions that catch people out. They refer to the number of times you need to stake your bonus amount or your bonus amount plus the deposit as a combined sum. Other aspects we might touch on include the social media presence, software, and mobile platform, VIP, and loyalty programmes. One of the instant telltales of a site’s trustworthiness is whether it’s part of a large network which can accommodate large selection of games, unique branded titles, and a single-wallet transition across its websites and the different platforms they’re available on. Some of the biggest names in the industry are Dragonfish, Virtue Fusion, which is the bingo network of the casino software supplier Playtech, Microgaming, Gamesys, and Cozy Games all of which offer superb quality of graphics and sound, producing some of the best looking and playing bingo and side games. Very often, you can also take advantage of generous promotions and pooled jackpots shared among all sites operated by the network. Dragonfish sites enjoy popularity not just because of the large number of games that few other networked sites can come close to, but also because they offer in-house developed games that can’t be found anywhere else, plus unmatched promotions in their loyalty programme – the Joy Gem VIP Club which encompasses eight of the biggest Dragonfish-powered sites. The network has had the largest number of openings in recent years. Bingo Besties and Yay Bingo were among its most successful 2018 launches with fully fledged bingo lobbies and diverse catalogues of slots, all perfectly optimised for mobile. One other important criteria worth mentioning is the RNG, or Random Number Generator. This is a special piece of software that is used to make sure the games and outcomes are fair and rely on chance alone. If the games could be rigged there would be no point playing them. All of the bingo sites we review use RNG, and these are regularly audited by an independent agency. This is your guarantee that the operator is giving all players an equal chance of winning. You should be able to find some reference to the RNG certification on a website. But if you’re reading one of our reviews you can be certain that we’ve checked out such information. The ball just keeps rolling as mobile technology is getting better and better, so the top providers have to keep up. The best of the bunch now have sites that are not only compatible with all mobile devices, but are designed to play extremely well so wherever you are you can log in and play. Mobile playing technology has brought the game to even more people and the accessibility means that even if you only have a few spare minutes you can get in a game of bingo anywhere. According to data from the UK Gambling Commission, the use of mobile phones and tablets to gamble has gone up by 10% in just a year from 2015 to 2016 and while we’re still waiting on the data for 2017, it would be a safe bet that they will be on the rise again. People are now gambling anywhere – virtually anywhere – in their bedroom, at work, on the bus, so of course they will need the flexibility and convenience of a mobile device to do that. And bingo networks are delivering. All operators have made their websites mobile-friendly now, so all you need to do is enter the website and start playing. Playing on the go is also possible in native apps. iOS users have already come to appreciate the diversity offered at the iTunes store since most of the brands have made their very own native apps available for download there, with the biggest names in the industry offering a full-fledged experience that takes in its stride depositing, playing, and cashing out. However, users playing on Android devices didn’t have it so well, at least not until recently. In August 2017, Google finally lifted their ban on real-money gambling and bingo apps at the Play Store in four countries, and lucky for us, the UK is one of them. So far, only the biggest names in the industry have launched their native Android apps but we’re expecting to see a lot more brands pitch in with their applications in time. The VIP Lounge – What are the Benefits of Loyalty Rewards Programmes? As you can see, bingo operators will go the extra mile in accommodating their customers and that’s just adding salt to your experience as a player. You get more choice and versatility in terms of games, as well as nice bonuses and promotions, prompt responses from customer care and a seamless transition across platforms. When you have found all of those at one place, you will most likely stick around with the site. As you come back to play, you can expect more promos coming your way with different daily deals, raffles, and tournaments but most importantly, you will be able to climb higher in the levels of the loyalty schemes and VIP programmes where you can get some really awesome perks. One fine example of all the good things you can find at a VIP club is the Joy Gem Club which encompasses eight sites from a Dragonfish network. Sapphire: deposit at least £20 and use the promo code ‘SAPPHIRE’ to get a 75% bingo bonus + 75% games bonus + 5 tickets for the Power Gem Games. Ruby: for a minimum deposit of £20, players can get 100% bingo bonus + 100% games bonus + 5 tickets for the Power Gem Games, using the promo code ‘RUBY’. Diamond: make a deposit of at least £20 and get 125% bingo bonus + 125% games bonus + 8 tickets for the Power Gem Games when you use ‘DIAMOND’ promo code. Black Diamond: deposit a minimum of £20 and use promo code ‘BD150’ to receive a 150% Bingo Bonus. Additional £25 bingo bonus + £25 games bonus + 25 Free Spins on Stampede + 10 tickets to the Power Gem game are also available to claim. Each member receives an upgrade package which can be between 75% and 100%, a birthday bonus, and special holiday treats. What’s more, you get exclusive access to special VIP rooms, promotions and competitions across all eight sites. As you progress up the levels, you will also be getting access to weekly VIP surprises, your own account manager, exclusive VIP events and chats in the bingo lobbies. Best part, it all starts the moment you start playing, no waiting for invitations or unclear terms for admission. Gaming laws in the UK had always prohibited commercial gaming stating that games could be played for small stakes as long as there was no individual gain from it. So cash prizes had always been illegal and games for prizes – usually pure entertainment or used for charitable means. Holiday camps such as Butlins had been putting on bingo games since they opened and had made a lot of money for charity. Things have been taken to a whole new level thanks to recent legislation. Now online halls, as well as land-based clubs are able to give out very generous prizes which take the form of bonus points, real money, holidays, cards, in fact you name it somewhere it’s been given away as a prize. Bet365 offers premium security with its RNG regularly tested by the UKGC-approved SQS agency, an SSL certificate by Thawte, and a Kaspersky certificate. The brand holds licenses from the UK Gambling Commission and the Gibraltar Betting and Gaming Association (GBGA). Adhering to a policy of responsible gambling, the operator not only offers self-exclusion options to its clients but also works in close association with organizations aimed at providing help with compulsive gambling. Bet365 offer their customers an extra layer of protection with its association with IBAS – a dispute resolution agency that steps in when a dispute cannot be settled between the client and operator. With all this in mind, we feel safe (pun intended) to say that bet365 is a reliable operator invested in player protection. Whether you play online or in a bricks and mortar establishment, the basic principles are the same. Bingo is played using a card divided into 27 squares, 9 columns and 3 rows. 5 numbers and four blank spaces are arranged in each row. ‘The caller’ is responsible for calling out the numbers drawn and checking winning tickets. Four corners – the far right and far left numbers on the top and bottom lines. Line – all five numbers on one line. Two lines – all 10 numbers on two lines. Full House – all 15 numbers. The caller then calls out each number as it is drawn, players check their cards and mark the number if they have it. Once all numbers needed for that winning combination have been marked, the player shouts to draw the attention of the caller to stop the game. The card is then checked and a winner is declared or the game resumes if a mistake is found. The last number called must be part of the winning combination or the win can be invalidated. A large proportion of online sites have an auto marking system so this is not so much of a problem now. Bingo has developed an interesting patois over the years, with callers drawing out the game by developing and using nicknames for the numbers drawn. Known as ‘bingo lingo’ this slang has even entered modern language and is recognized by many, with ‘two little ducks’ (22), ‘the key to the door’ (21) and ‘legs eleven’ as examples. With the widespread use of random number generators in halls today the practice is dying out, but kept alive in smaller venues and holiday camps. Bonuses are the most common reason why players would choose one site over the other but what you need to consider before you make a commitment is what comes after the bonus. Because there you are – having claimed that juicy welcome offer and now, you’re stuck with a limited choice of games that you eventually get tired of playing. Choosing a website that offers you diversity and uniqueness when it comes to games is crucial for your experience. At most sites, you will find the obligatory 75- and 90-ball rooms and some slots and since most of the networks have numerous sister sites, you are very likely to come across the same games. There is hope, however, for many stand-alone sites can offer you something different with their own proprietary software and branded games. Besides the two most common variants (90- and 75-ball), you can also come across 40-, 50-, and 80-ball bingo, as well as a speed version with 30 balls. Many people love the social aspect of the close knit communities of bingo sites but for those who prefer to play on their own, there is also a single-player variant – instant or Video bingo. This fast-paced game played with cards instead of the traditional bingo balls is taking the bingo world by storm. Get your five-card ticket, cover all of them and win a great jackpot! This 40-ball variant gives you the chance to win a special Rainbow Riches bonus, as well as progressive jackpots. Coins collected can be used on both the slot and bingo games. Flash Fives and Vegas Bingo are other versions where the balls have been replaced with cards, so if you’re looking to diversify your gaming experience, you should definitely check those out. Games based on famous TV shows have become players’ favourites and now, due to popular demand, you can find all sorts of themed games like Deal or No Deal, X-Factor, Britain’s Got Talent, Coronation Street, and more. Side games are another way to spruce up a dull play. Slots are heavily featured at all sites and it’s usually the most popular progressive jackpots or the latest titles that offer exquisite graphics and smooth gameplay. And since featuring only slots is no way to stand out, some operators also offer table and card games like roulette, blackjack, and hi-lo. There are even live games that let you interact with real UK dealers. Some of the most popular games are live roulette and blackjack, as well as fun new releases like the Wheel of Fortune which lets you be part of the popular TV show without leaving your dining room. Known once as a favourite pastime of the elderly population, our favourite game has made quite the transformation over the last few years. The game has moved on from the dimly lit halls where blue rinses used to float amid clouds of smoke and is now available to everyone with an internet connection. In the last couple of years, we’ve seen a decline in the number of land-based bingo venues by 2% and the number of arcades in total has gone down by 11%. Crossing over into the virtual realm has naturally made the game more appealing to a new, younger, more tech-savvy audience which has led to a change in the statistics regarding players’ age and gender – more than 3 million people in the UK log in to play a game online and almost 700 000 of them will be between 18 and 24 years of age. There has also been an increase in the percentage of people under 45 playing the game as well as the number of male players. So, what has led to such surge in popularity and switch of players’ data? Let’s have a look. Once you’ve decided which site you want to join you will need to register. Registering is very simple and usually only takes a minute or two. Due to the gaming laws of this country, for a lot of sites you must be a resident of the UK to play. You will be asked to create a username and password unique to you. There will be security questions that you set the answers to, which can be used for verification purposes in the future. Making a deposit into your newly created account is just as simple. Use a credit or debit card, or you can even use PayPal on some sites, and you are ready to go. Most have a minimum deposit of £10 but there are some as low as £5. Most games are played for small stakes but have relatively large payouts. This can seem very strange to the newcomer and gives the impression that it may be easy to win. Online halls are able to do this by what is known as a linked game. Linking the actual game with several other sites ensures enough players join the game. All promotions are individual to each site they just pool players to make up the numbers. Similar systems are used in halls which allow them to generate large payouts. One of the largest was over £1 000 000 in the ‘National Game’. Payouts have steadily risen you can now compare bingo sites to old-school halls, they have definitely upped their game in recent years. There are thousands of pounds available to win from the top sites every single day. Not only offering bingo but a variety of casino games as well, the opportunity to win big is very real. The record payout from a site is £5.9m to a UK resident won with a 30-pence stake. A very serious amount of money! 888Ladies is one of the longest-running and most popular with players sites, and it only takes a look at the numbers to see why. The site offers more than 350 slots – an exquisitely balanced mix of the most sought-after progressive jackpots, the latest releases from the leading software providers, and boutique games developed exclusively for the network at their Studio8. The site also boasts a most excellent variety of casino games, including Evolution Gaming’s flagship live games. But playing online bingo is not all about the money. The social aspect of the game is very much a big part of it. Moving from land based halls you would think that the opposite was true. But as technology has evolved so has our social networking. Our friendships are no longer bound by a geographical or physical nature. We can interact with more people from more locations than ever before. Pen pals have evolved and we can now chat and play together in real time. All the popular sites have an almost holiday camp entertainment feel about them. The chatrooms are buzzing with activity with moderators keeping the atmosphere going, just like a redcoat would. According to research, 47% of players have been able to from a new circle of friends thanks to the chat funtionality of the rooms, and 50% say it has become a part of their daily routine so they will log in and play at least one game every day. Annual Gambling Awards – Which are the Critically Acclaimed Sites? As in any other industry, both B2B and players’ choice awards are a symbol of prestige and any bingo operator would like to claim such accolades in recognition of its software quality, customer care, and community spirit. The biggest event in the online gambling industry is the eGR Operator Awards which this year took place on October 26th 2017 at the Grosvenour House at London’s Park Lane. In the bingo categories, the biggest winners were tombola – awarded the prestigious ‘Bingo Operator of the Year’, Mecca Bingo which was distinguished as offering the Best Mobile Bingo Product, and WhichBingo that scooped the ‘Best Bingo Affiliate Award’. In terms of recognition from players, there are two award ceremonies of significance – the Which Bingo Awards and the Bingoport Players’ Choice Awards. Here, the winners are crowned based on people’s votes, making these awards just as important and prestigious as the B2B awards, as they give a truthful insight into what real users think of the top sites. The 2017 Which Bingo big winners are Heart Bingo crowned ‘Best Online Bingo Site’ and Mecca which earned the award for ‘Most Socially Responsible Operator’ and ‘Best Customer Service’, while Playtech award for ‘Best Online Bingo Software’. At the Bingoport Players’ Choice Awards, ‘Best Bingo Site’ went to Sun, which was the winner of the night,and also won the ‘Best Online Bingo Promotion’ award for their ‘Everyone’s a Winner’ campaign, and being voted the site with the best online community. Bingo has been around now for hundreds of years it is such a simple game, yet it delivers a level of excitement that just keeps people playing. Couple that with the opportunity to make some money and it looks like this favourite pastime is not going anywhere. In fact the number of people playing the game is steadily rising and with technology advancing rapidly the gameplay will be more and more user friendly. The competition in the market will keep companies customer focused, with more promotions and freebies it can only be a good thing for the avid bingo playing public. Remember that with so many to choose from, finding the best one can be a bit of a challenge. Make sure you do your research, looking into what they all offer and whether they meet certain criteria. And to help you cut your list of usual suspects down to a manageable level, spend time reading our online bingo site reviews. We’ve done all the researching for you and left you with the task of trying a number of them on for size. If some of the prospects are offering free welcome bonuses then go ahead and take them up on their offer. First-hand experience is worth a heap more than anything you might read. So you’d be mad not to do it, wouldn’t you? Is there really such thing as free bingo? Yes, in fact there is. There are two options you can play bingo for free – you can either claim a no-deposit bonus and use it to try the games without making a payment, or you can join a website which offers free games in some of its rooms. Keep in mind that these rooms are usually open only for a limited period of time during the day and you are usually required to have funds in your account in order to join. Some of the biggest brands also have Newbie rooms where players who have just signed up can play and practice for free during their first seven or ten days at the site. Of course, free bingo is more recreational than anything, so don’t expect to make huge winnings without having deposited. Are only sites licensed by the UK Gambling Commission safe to play? If you’re residing in the UK, you need to make sure that the bingo site you’ve chosen to play at has a license from either the UKGC or some of its whitelisted jurisdictions. All land-based and online halls need to operate under such license and are obliged to display it clearly. Look for the logo of the commission at the footer of the homepage and don’t deposit money to a website which doesn’t have a logo of a regulatory body. A click on the logo will take you to the licensing body’s website where you will be able to look up the license number and current status of the operator. Make sure the website also has encryption – look for the green padlock at the address bar and check if the connection is secure. Why can’t I open an account if I haven’t registered with the website before? Usually, one bingo network will have several sites under its name and will allow players to use their credentials to log into all of them after opening an account at one. This means that you won’t be able to set up a new account using the same email and username. However, you can log in and still play, but you won’t be able to take advantage of the promotions and bonus offers for new players.